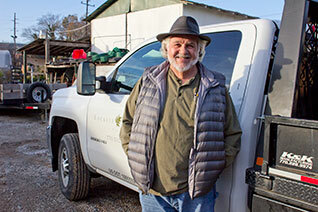 Forty years in the construction industry has given David Marshall the right toolbox to materialize the dreams and ideas of our landscape designers, allowing us to add beautiful well-built elements to our clients’ gardens. From concept to finished product, David takes responsibility for the overall direction, coordination, execution and completion of construction projects ensuring consistency with company strategy, commitments and goals. For ten years, David worked on projects developed and built by Wilwat Corporation and Post Properties, where he specialized in producing creative, custom built structures such as clock towers, club houses, cabanas, kiosks and apartment units. Additionally, for thirty years he owned and operated Marshall Contracts and Marshall Concepts providing framing services for residential and commercial endeavors. His portfolio includes patios, decks and gazeebos of all kinds. Before committing to the construction industry, David studied accounting at UNC Chapel Hill School of Business. As Construction Manager, David coordinates in-house and external resources for the flawless execution of projects, and by determining resource availability and allocation ensures that all projects are delivered on-time, within scope and within budget. David’s toolbox includes skills in planning and organizing, decision-making, communication, leadership, delegation, negotiation, conflict management, adaptability and stress tolerance. Beginning at the drawing board, David works with our design team to develop construction details that define construction methods, identify required tools and equipment and specify fabrication materials that are structurally practical, available and scope-appropriate. From there, David develops a budget for the project. He negotiates with vendors for the purchase and delivery of materials and he identifies the tools and equipment required. David assembles the project staff, communicates landscape construction tasks, provides direction and support to the team; he coordinates with landscape sub-contractors, assures quality, monitors safety, relates to our clients, manages change requests, and provides progress reports throughout the project.